What are these three unrelated singers with short first names doing to contribute to American folk music?? Exciting News! New release, titled "Downsized", now available. * Read a review from the UK's Folk Roundabout Magazine and the Fatea Website here. or download the whole issue directly as a pdf by clicking here. A 7 minute podcast from the Branford Folk Music Society can be heard here. The Short Sisters Digital Releases on CD Baby can be reviewed and purchased here. The Short Sisters challenge the audience's imagination and invite their participation with compelling words, powerful melodies and elegant arrangements. Audiences comment on more than just the trio's extraordinary harmonies and choice of material. Their playfulness and pleasure in each other's company leave listeners energized and cheered. Their repertoire includes intricate rounds, songs from American, African-American and British traditions and material from contemporary songwriters. 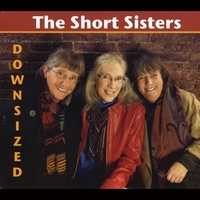 The Short Sisters' favorite songs, funny or moving, thought-provoking or frivolous, traditional or newly written, convey optimism about tackling life's challenges. The trio's performance list covers Folksong Societies and Coffeehouses in their home states of Massachusetts, New Hampshire and Florida, forays to Michigan and California, and regular appearances in New Jersey, New England and Washington D.C. They have recorded five albums, four of which are available on CD. Songs both traditional and new: unusual rounds, musical curiosities and chorus songs, Sacred Harp songs, ballads and much more. Whether a capella or with guitar, autoharp and banjo, the Short Sisters blend their voices in stunning and original harmonies.